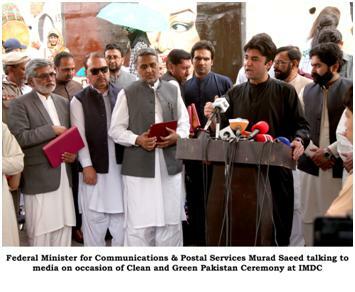 Federal Minister for Communications and Postal Services Mr. Murad Saeed has said that countrywide Clean and Green Pakistan drive is moving forward at a rapid pace, which aptly reflects vision of Prime Minister of Pakistan Mr. Imran Khan. Ministry of Communications and National Highway Authority are hand in hand to make motorways and highways network Clean and Green. He was talking to media men on occasion of Clean and Green Pakistan Ceremony held at Islamabad Murree Dual Carriagway (IMDC) yesterday. Minister for Communications and Postal Services Mr. Murad Saeed and Chairman NHA Mr. Jawwad Rafique Malik also planted trees.